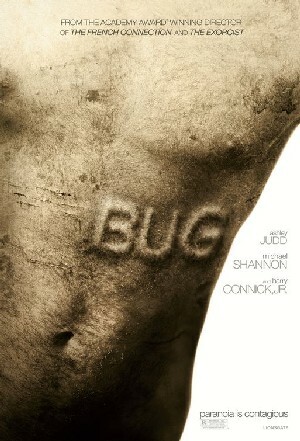 As part of hubby's birthday celebration years ago, we watched the movie "Bug". Recently we caught it again on video. It starred Ashley Judd, Harry Connick jr., and Michael Shannon. It is based on a novel and play about a lonely girl who lives in a dingy Oklahoma motel room and a creepy ex military spewing off conspiracy theories every chance he gets. This is such an intense film from the man who gave us "the exorcist" eons ago, William Friedkin. Michael Shannon reprises his role in the play as Peter Evans, the ex soldier who is convinced that the government used him as a petri dish and implanted bugs under his skin as part of a top secret government experiment. He gives a compelling performance as a delusional man who really believes that bugs are literally crawling and living inside his body. He exhibits enough vulnerability that makes you believe that he is a good, sane man victimized by the government, yet exudes dark force as evidenced by spurts of violence, either inflicted on himself or on others. Ashley Judd is such a revelation in this movie! I have always liked her, from the serious action/drama: double jeopardy, high crimes and twisted to the cutesy wootsie movie someone like you. I just like her... Her face, her acting. In this movie, she's not dolled up and yet you can still see how pretty she is. she gives so much emotion in the way she delivers her lines, her acting lets you know how it feels to be a simple-minded separated woman who lost her child in a grocery store 10 years ago and now feels that she has nothing to live for and no one to claim as her own. A desperate, sad woman who'd give anything to keep the first relationship she'd had in years. I know not everyone will agree, but I loved this movie. They talked a lot, and usually that is a big turn off for me, but this time, the emotions and the intensity that flows between these two people having a conversation was entertaining enough for me. This is such a powerful movie about loneliness, paranoia, and well, shared insanity i guess. did they really have bugs in their skin? Was it all in their minds? You be the judge. A simple creepy film with great acting. Definitely worth watching. Berto and I liked how it played with our minds. If you're into that, go and watch it.